For the past forty years, scholars across the humanities have routinely rejected aesthetic inquiry as ideological, exclusionary, or politically quietist. In American Studies particularly, this anti-aesthetic attitude has congealed into the field’s common sense. Only in the most recent past have several scholars begun to pay renewed attention to the aesthetic and to rethink its relationship to the spheres of the social, economic, and political. 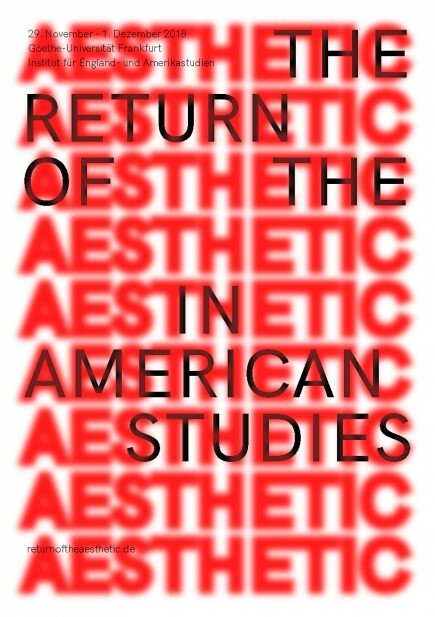 “The Return of the Aesthetic in American Studies” critically takes stock of recent returns to the aesthetic and extends their scope. Scholars working in such diverse areas as media studies, identity theory, animal studies/posthumanism, and democratic theory have begun to put the aesthetic dimension of their objects of study at the center of their work, even if they do not necessarily consider their scholarship to belong to the field of aesthetics proper. To bring these approaches into the conversation, we propose to broaden the definition of “aesthetics” so as to reflect that in American Studies – as much as in many other disciplines within the humanities – “the aesthetic” is increasingly recovering its original reference to sense perceptions (aisthesis). At the same time, however, scholars have also begun to rethink traditional concerns of aesthetic theory. In particular, they have been revisiting the question of aesthetic autonomy. Far from conceiving of aesthetic autonomy as apolitical, the resurging debate explores its potentially oppositional and utopian position vis-à-vis recent economic, social , and political developments. These two major strands of recent aesthetic inquiry are often in tension with one another. While conceptions of the aesthetic that emphasize the notion of aisthesis tend to assume that the aesthetic is a driving force of recent social, political, and economic developments (like the solidification of neoliberal capitalism or the rise of populism in Western democracies), conceptions of the aesthetic related to artworks tend to regard the aesthetic as a potentially oppositional force to these very developments. So far American Studies practitioners have not yet adequately reflected on the co-presence of these two concepts of the aesthetic. Thus, the conceptual differences between them and the ramifications that these differences have for assessing the relation between the aesthetic and various social forces have hitherto remained unaddressed. Can the two major strands of aesthetic inquiry mutually challenge each other to interrogate uncritically accepted premises? To what extent do they unwittingly borrow from each other? And what are the avenues to aesthetic inquiry outside of the two strands sketched here? We do not charge any registration fee.